Looking for that odd broken piece on your late model car? I have been using them more and more over the past 2 years. The price list is cheap for example a complete bumper for a 2000 Corolla $38.99 included the plastic cover, the reinforcement bar and the all the clips as well as the filler foam. the same thing in aftermarket was $160.00. Honda Civic emblem $36.19 at the dealer $2.99. You can also get rid of your junker for the scrap metal value or donate the car through the Kidney Car Program. Draw backs of the u pull format you have to pull the parts off yourself , also you have to be 18 years old to able to get in. This guy has saved me time and money for years . He is mobile and provides excellent service . Whether you are stranded with your ignition lock not turning, car keys lost, broken or stolen, or just need a spare key for your car, we are here to help you. Just a heads up for our regular customers the Apple Auto Glass at 474 Gladstone ave is now a Speedy glass. 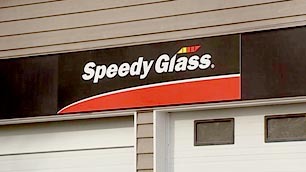 Same great glass service, you can details from www.speedyglass.ca or email Marty (SPEEDY8630@belroncanada.com) for questions or quotes. Since many of my customers ask about this issue I thought I would put out a good resource on my website. This website http://www.insurancehotline.com is a great resource for those confused about getting car insurance, looking for a better rate or making an insurance claim . Here’s what you need to know when deciding whether to report your insurance claim, or pay it yourself. “Your Insurance Rate: A driver with an accident can see their insurance rate jump from $1,500 to over $5,000, and remain high for 6 years. Note: Your insurance rate does not increase in proportion to the amount of damage, regardless of whether you have a fender bender or have written off a Bentley. Paying Your Own Claim: If you choose to pay your own claim, particularly in a single vehicle accident, you protect your insurance rate from an increase. If you’ve had a prior accident in the past 6 years, or tickets in the past 3 years, the combination can cause your insurance company to cancel your policy. If you are interested the website goes on more into detail about when to switch insurance provider or when to make a claim. Many people have been frustrated by the new emission rules in Ontario. I called “driveclean” on many occasions to see if they had any solutions for passing the new emission test. They had nothing but generic answers for me. In the past couple of weeks I have been scanning my cars with a scanner that was originally designed for California emission standards. I have had it for about 5 years and it has helped me pass many of my cars through driveclean. This scanner has three led lights at the top of the screen. If you have an engine code you will need to fix it; it is an automatic fail. If it shows red it is and automatic fail. If it shows yellow it means the computer is not ready to test yet; do not test since it will most likely fail. If it shows green you are good to go for the test. I found a great new website for touch up paint. Great help with those nasty scratches or chips that don’t require professional painting. Even I have problems finding paint codes at times. It is a very helpful tool to look up paint codes for various vehicles- both foreign and domestic. Just a heads up to every body who needs an Emission test. The Ontario standard is now as difficult as a California Emission test. If you have a “service engine soon” light or amber engine light on do not go in for a test it will be an automatic fail. You need to get your car fixed first and then drive the car around for it to be “ready”. The new system is very complex and the driveclean 1-800 number is at best useless for both private owners or dealers.